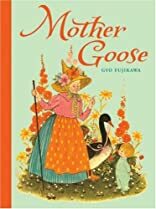 Pat-a-Cake," "Simple Simon," "Rock-a-bye, Baby:" these and the many other rhymes that make up Mother Goose have become almost as much a staple of child-rearing as the rattle and the bottle. Little ones love its mix of lullabies and limericks, humor and sing-song verse, and they learn from it too. Gyo Fujikawa brought her inimitable style to this version, which features a mix of enchanting line drawings and warm color pictures. Adorable mice, led by a duck in uniform, man the boat in "I Saw a Ship a-Sailing." A multicultural group of children circle round "The Mulberry Bush." And "The Three Kittens" have never been cuter. Fujikawa has succeeded in creating a truly magical world for kids to enter.